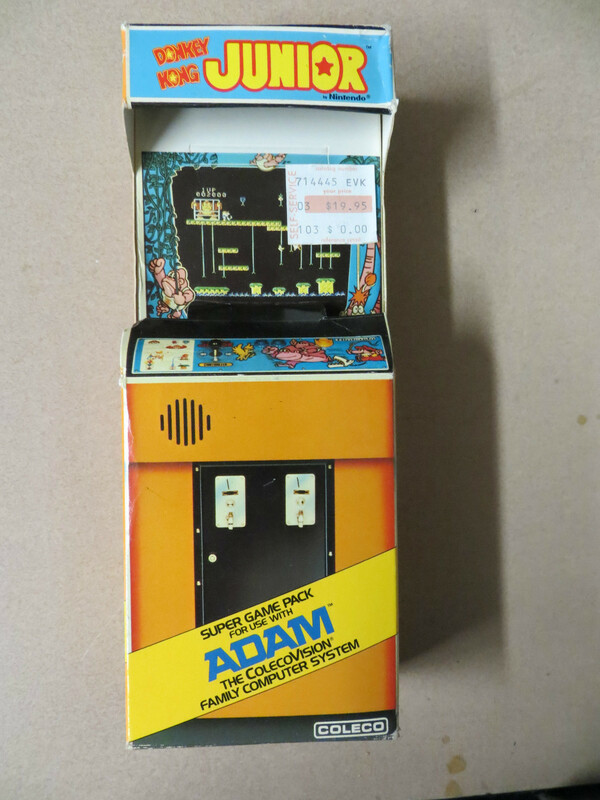 Made in England by Ideal Toy Co. Ltd., Woodley, Berks. 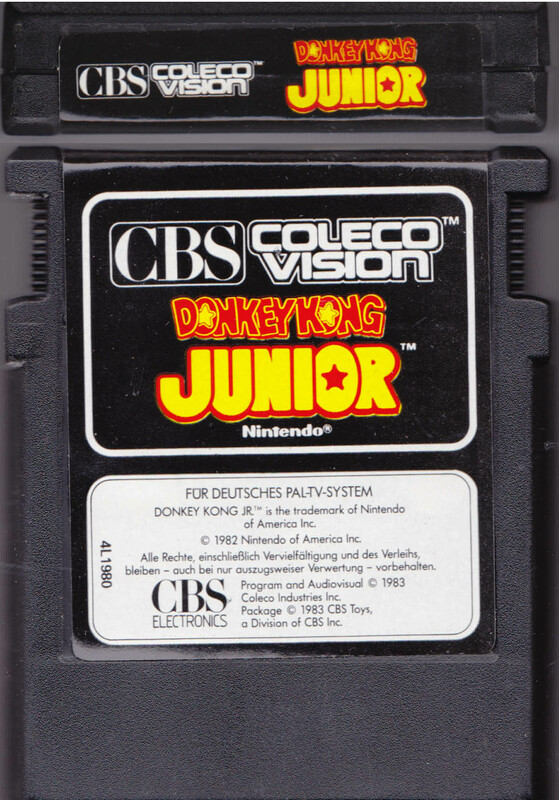 Printed in Holland. 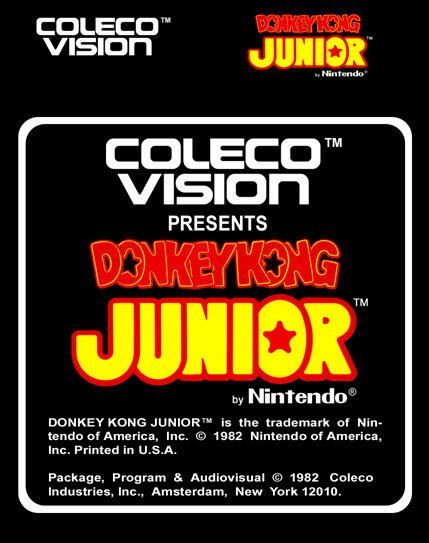 Donkey Kong® et Donkey Kong™ Junior sont des marques déposées appartenant à Nintendo of America Inc.
Alle Rechte, einschließlich Vervielfältigung und des Verlheis, bleiben - auch bei nur auszugswaiser Verwertung - vorbehalten. 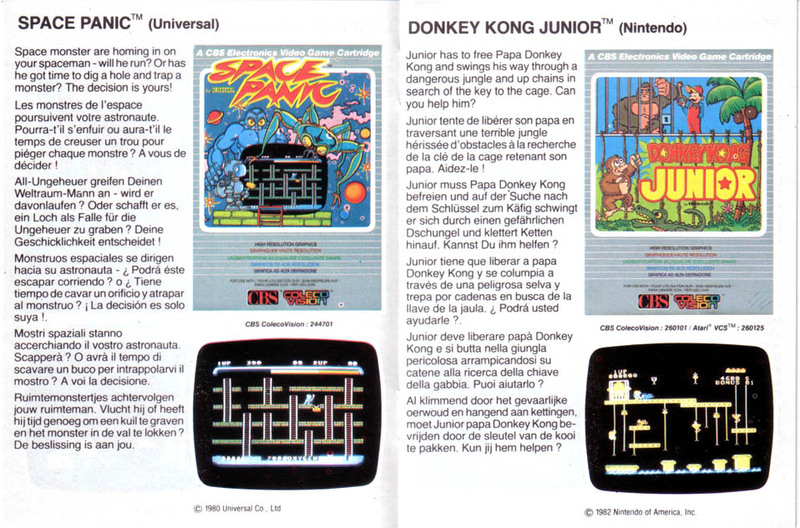 DONKEY KONG™, DONKEY KONG JUNIOR™ und MARIO sind die Warenzeichen von Nintendo of America, Inc. © 1982 Nintendo of America, Inc. 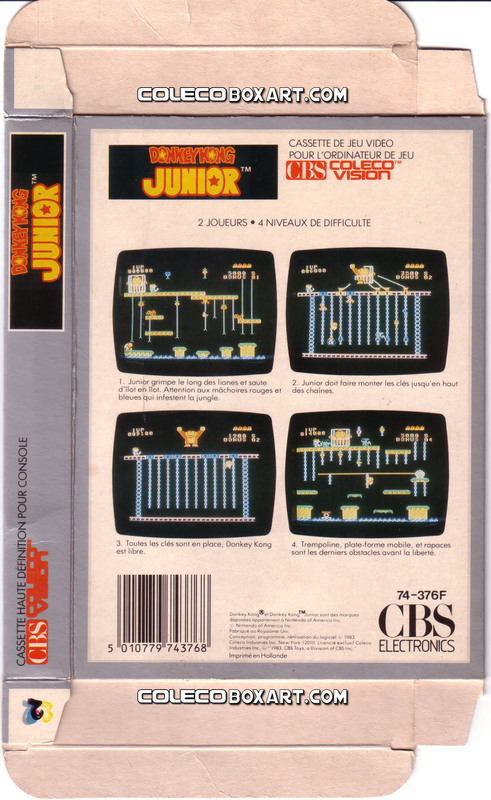 Program and Audio Visual ©1982 Coleco Industries Inc. 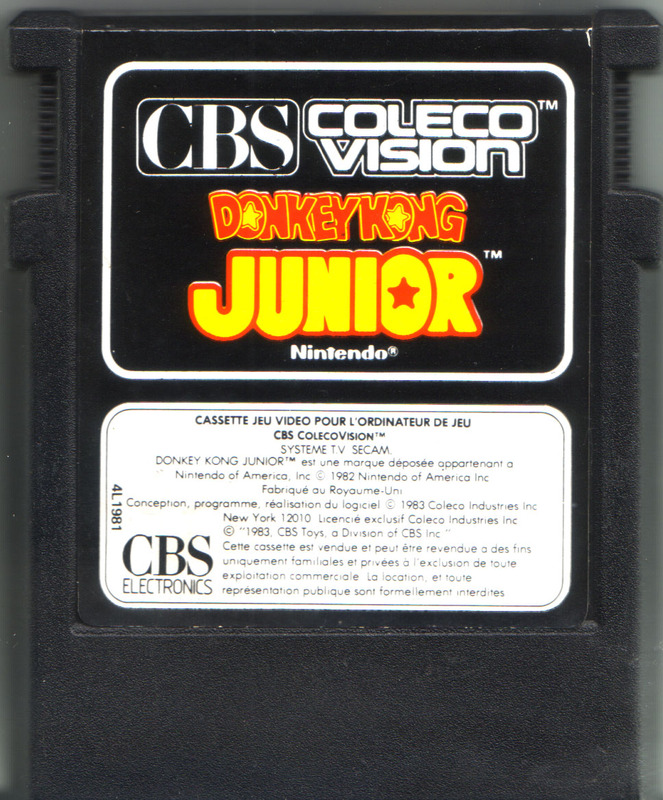 Printed in Holland. 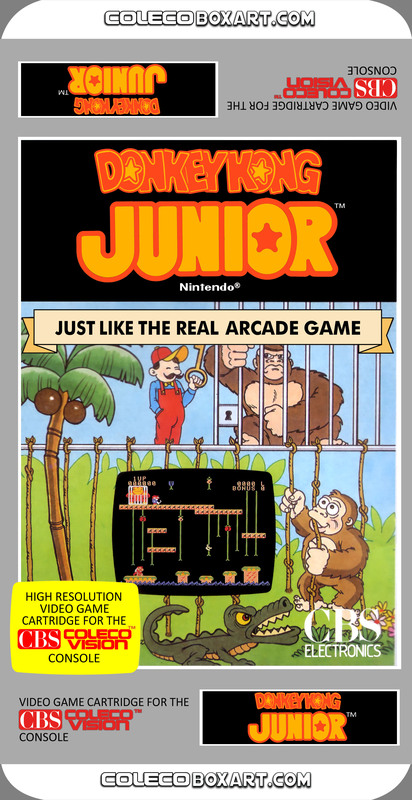 Mario has locked up Papa Donkey Kong, and Junior must hurry through a treacherous jungle to free him. 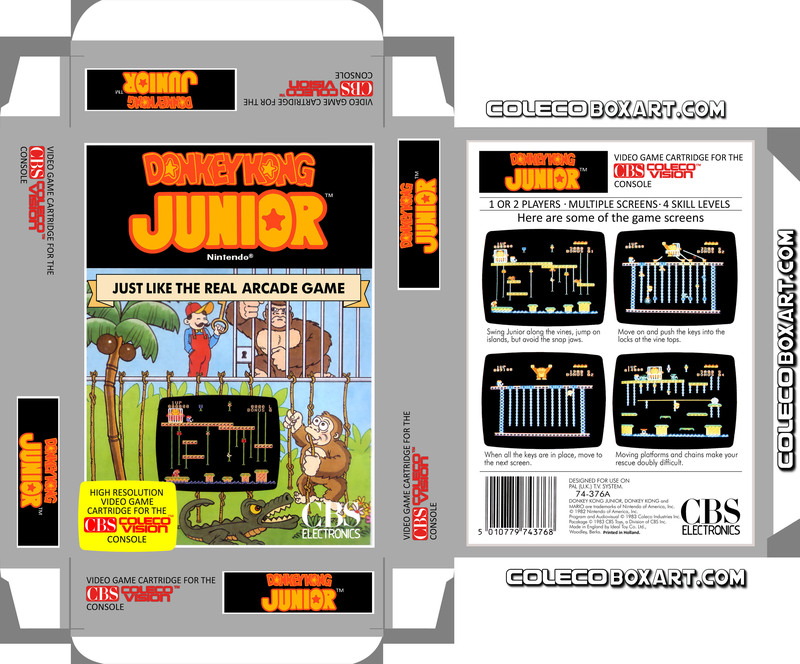 Racing against time, Junior climbs and swings across vines and avoids dangerous creatures, all to reach a flashing key to release his Papa. 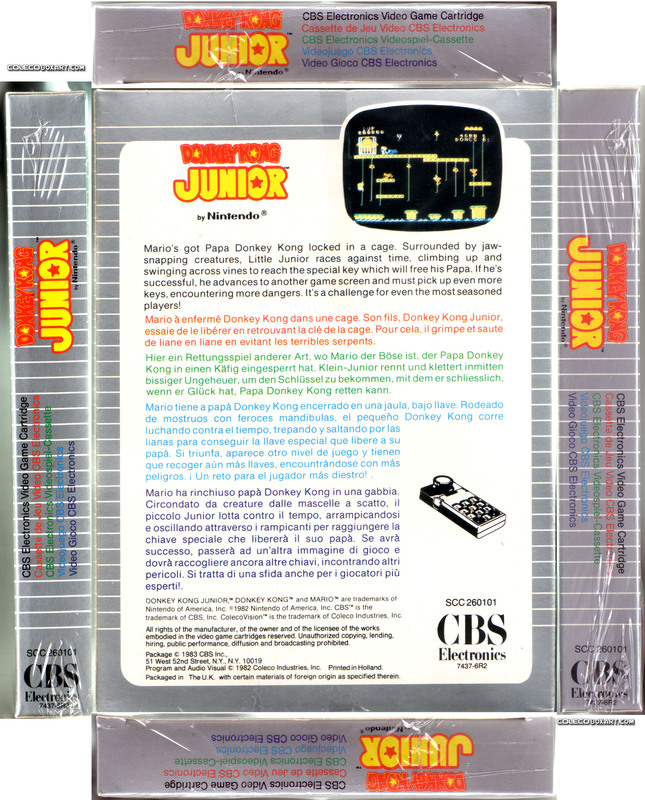 If Junior succeeds at this mission, the scene changes. 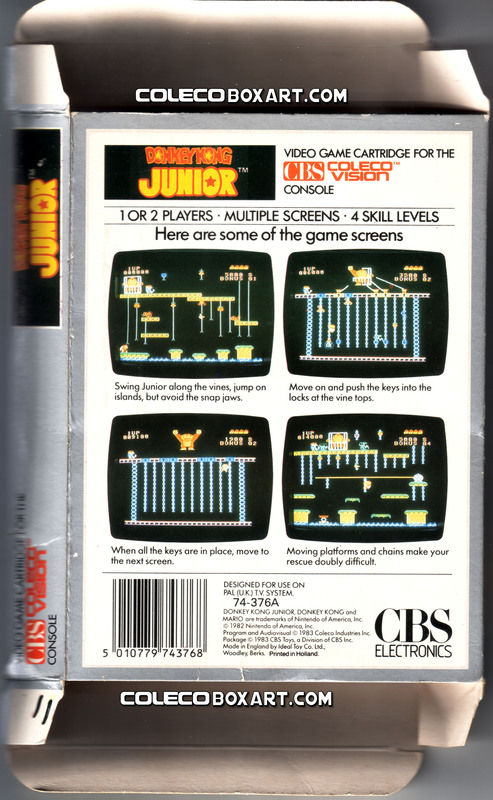 Junior must push keys to the top of long chains, once again avoiding clever opponents. 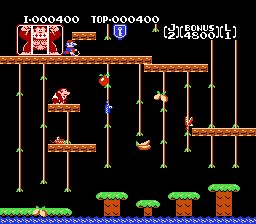 If he completes this test, he must climb the vines again – this time it’s tougher! 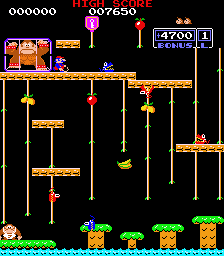 Then he arrives at the high-flying jump board mission. 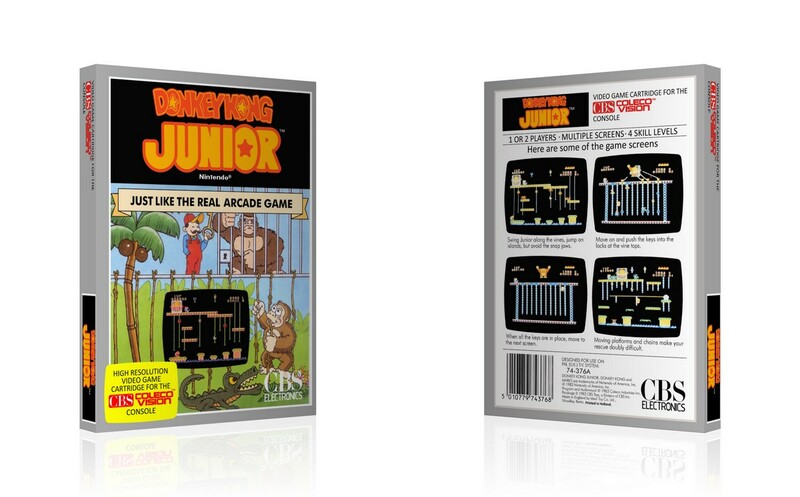 Can you help Junior save his father? 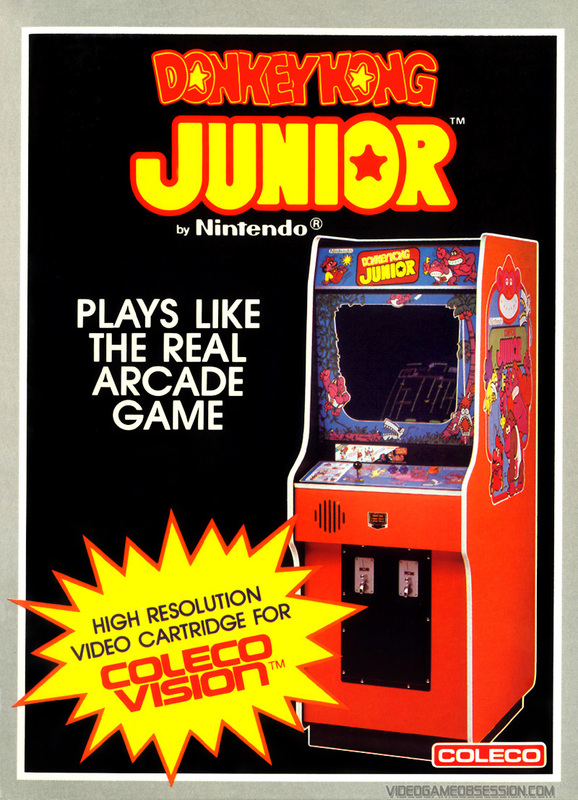 Port of Nintendo’s arcade game released in August 1982. 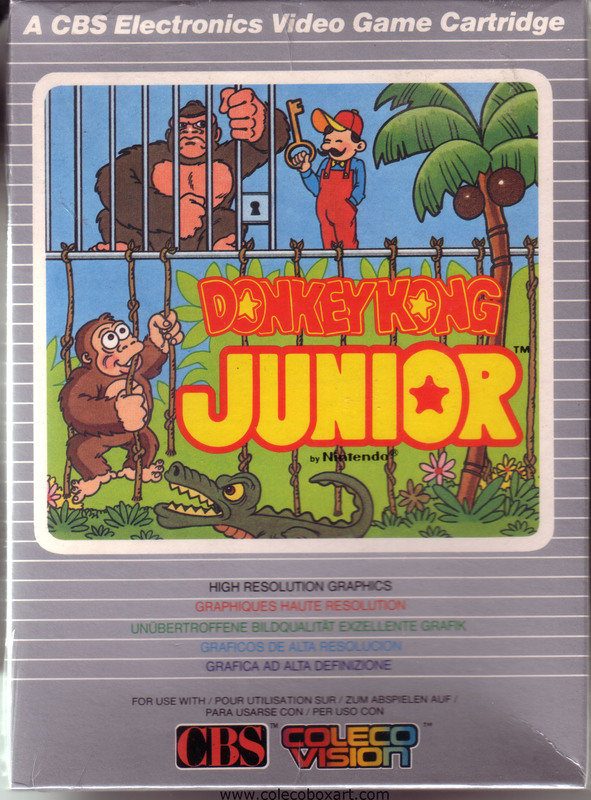 In this game, Donkey Kong's cage is guarded by Mario, in his only appearance as a villain in a video game. 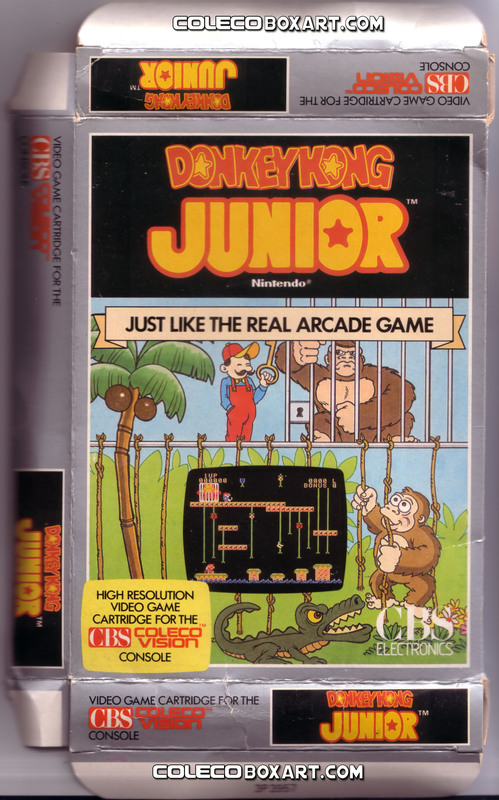 Donkey Kong Jr. was also a cartoon on Saturday Supercade (a cartoon series that aired on Saturday mornings from 1983-1985). 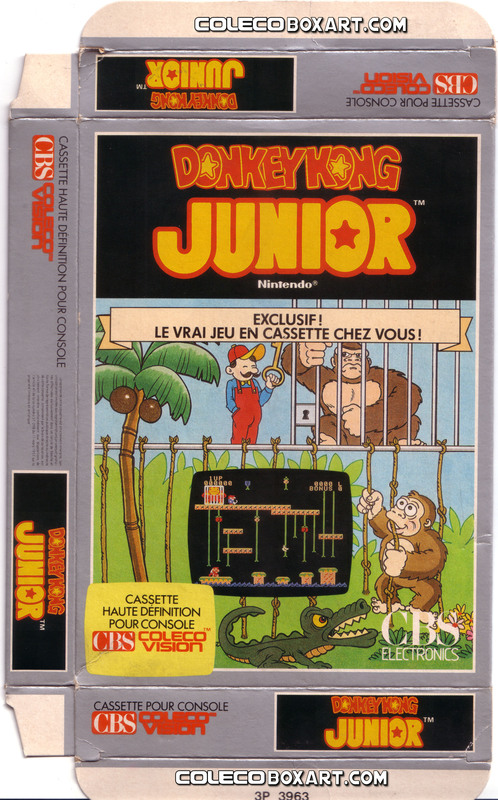 The plot had Jr. looking for his dad Donkey Kong who is on the run from Mario and Pauline. 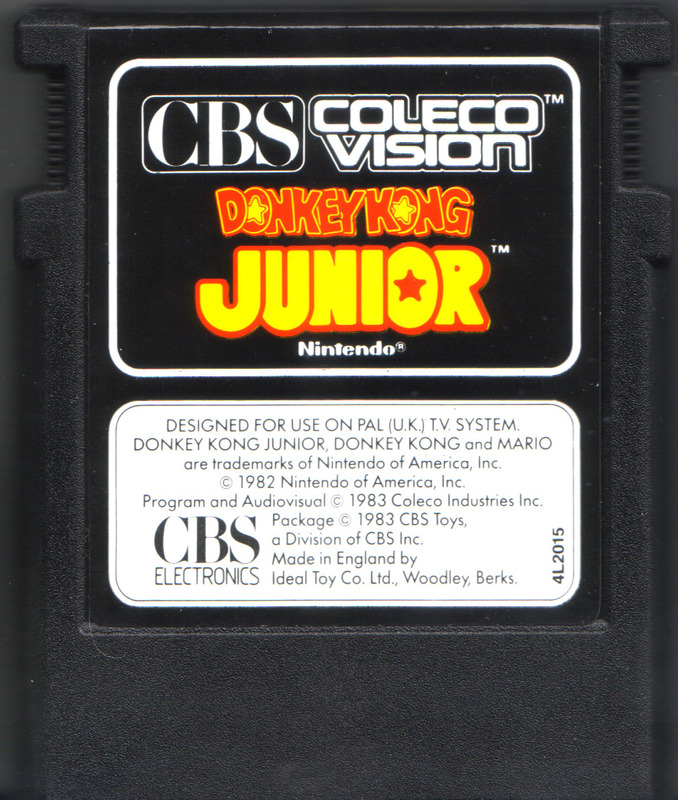 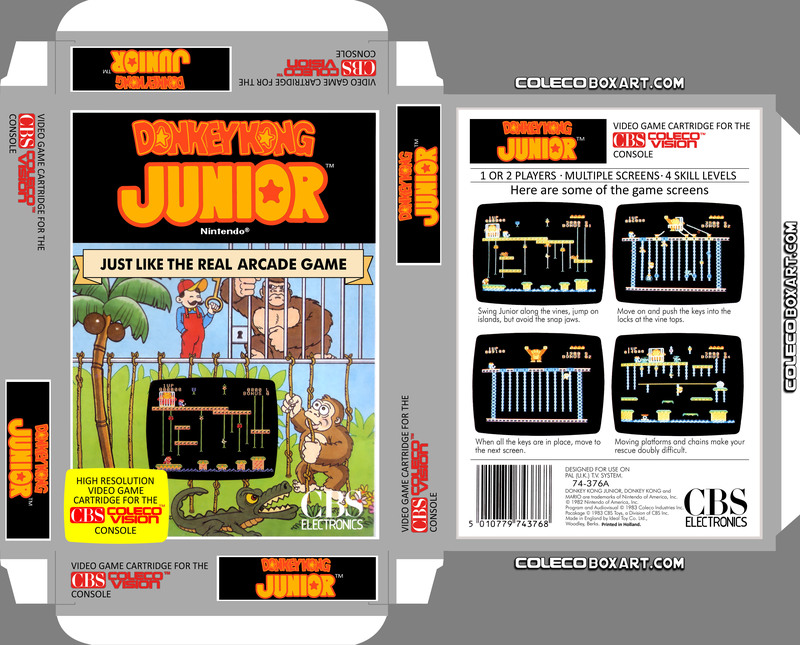 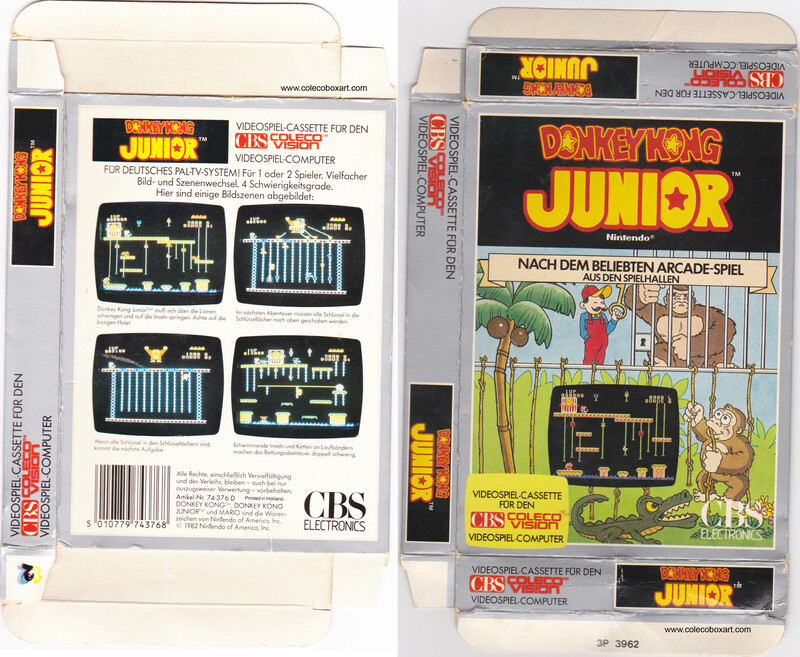 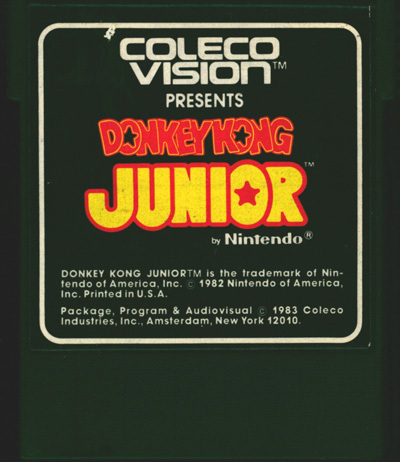 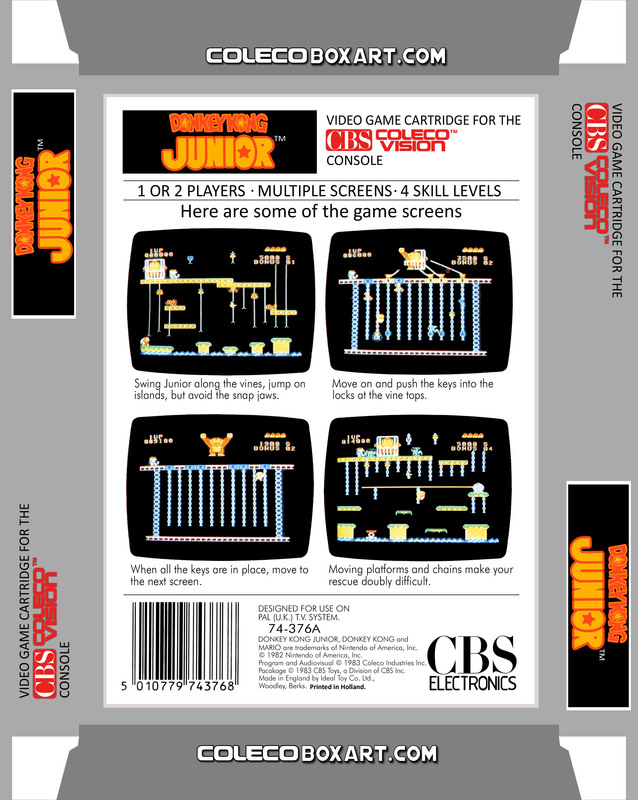 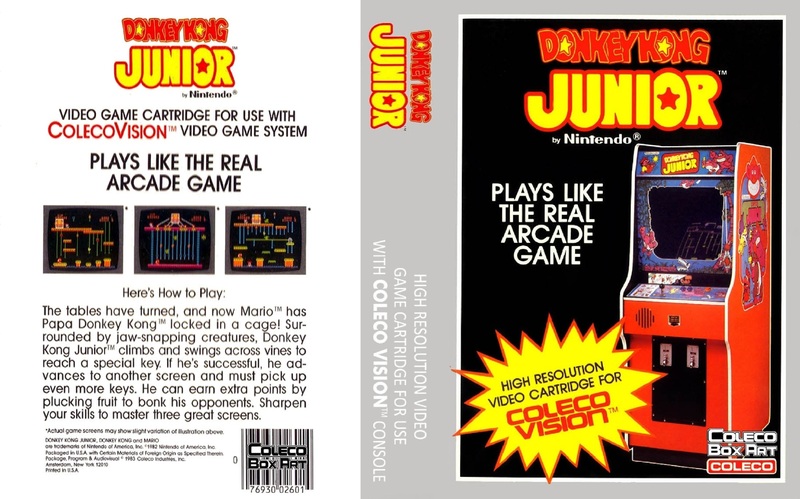 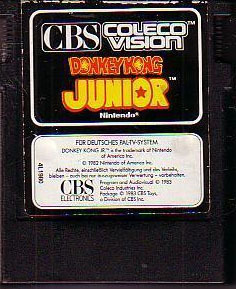 Super Donkey Kong Junior was to be released for the Super Game Module. 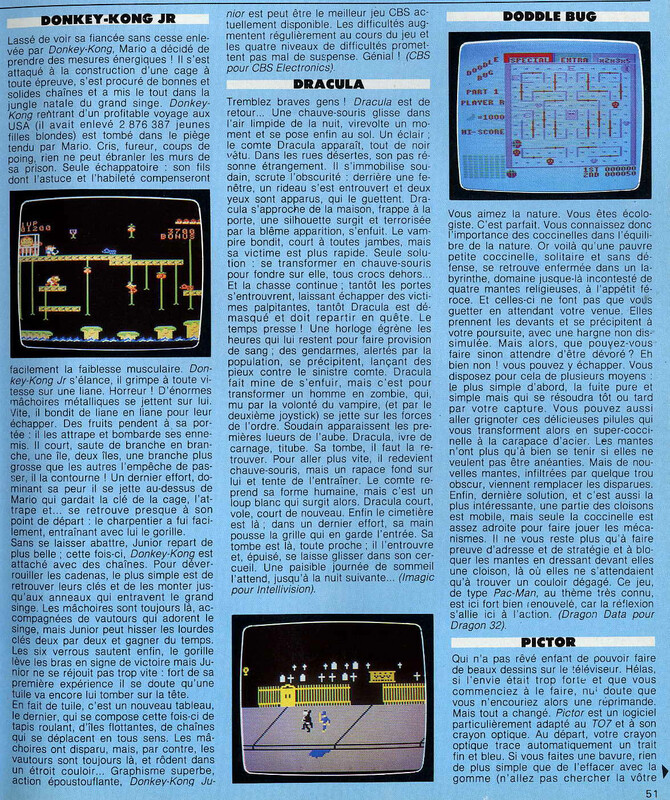 But as this module was canceled, the game was ported to the Adam Computer. 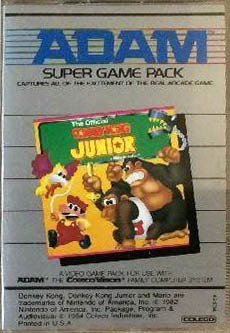 The Super Game version for the Adam computer has the Mario's Hideout level, a new level (the kitchen), an intermission between levels 3 and 4, different music at the start and some different effects (such as climbing), High Score table. 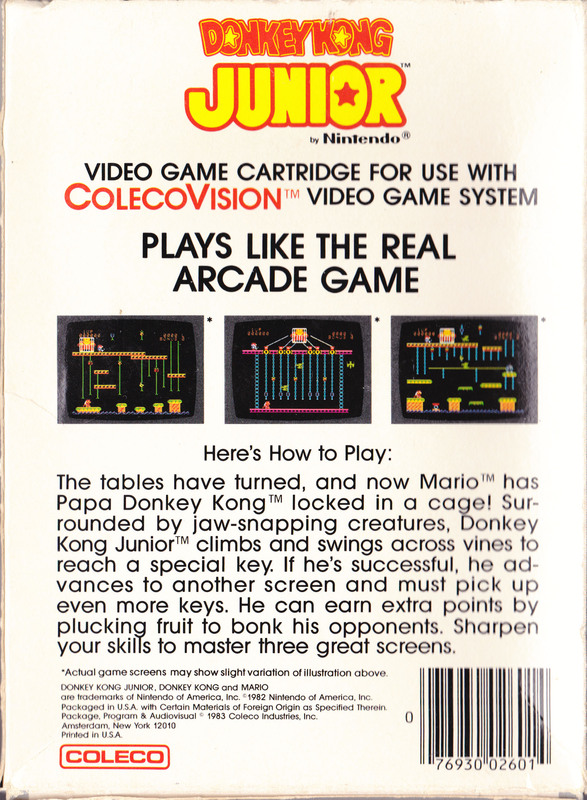 An additional 5th screen was originaly planned before Nintendo complained about the changes/additions and Coleco had to remove it. 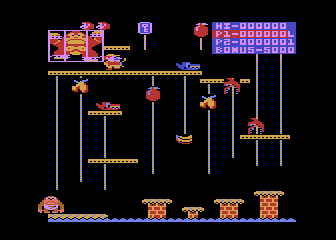 A remake for the C64 based on the Atari 7800 version was made in 2014 with remade graphics and enhanced sound.